Thanks to the newly wealthy Chinese and an easing of travel restrictions, Macau's casino market has overtaken Atlantic City in size. It generated $5.6 billion in casino-gambling revenues last year, second only to the Las Vegas Strip's turnover of $6 billion. Last year, Macau attracted 10.5 million Chinese visitors, a 147% jump from just three years earlier. For two years Las Vegas Sands has been the only U.S. casino operator to enjoy the explosive growth of gambling on this tiny nub of Chinese territory near Hong Kong. In the six months ended June 30, the Sands Macao reported $592 million in revenue, outshining the $455.3 million from the company's flagship Venetian Las Vegas. This week legendary American gambling mogul Steve Wynn opened his $1.2 billion Wynn Macau, a near-replica of Wynn Resorts's splashy Las Vegas resort. 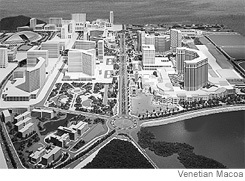 Meanwhile more than a dozen casino projects are in the works between now and 2010. Galaxy's new flagship, the StarWorld, is set to open soon next door to the Wynn Macau. Stanley Ho's Grand Lisboa, is a work in process designed to resemble a lotus flower made of gold ingots. The MGM Grand should add to this downtown action in 2008.